Tired of mouse receivers that you have to pack up every time you're on the move? 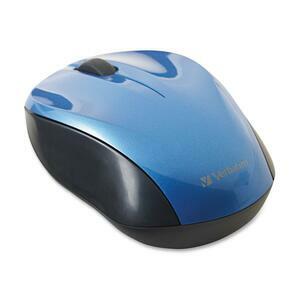 Then try Verbatim's Nano Wireless Notebook Mouse. With a receiver that's small enough to plug into your laptop and leave, it offers 2.4GHz wireless performance-that means no delays in cursor movements and fewer cords to pack. The receiver can be stored inside the battery compartment for safekeeping. Its sleek design offers a smooth, contoured comfort grip for right or left hand use and a programmable roller button, which means you can assign your favorite features to the roller and make your work easier. If you need a mouse that travels well in tight spaces, this mouse is for you. Small enough to fit easily in work totes, backpacks or even handbags, Verbatim's Nano Notebook Mouse makes it super easy to Go Nano.